The Tissue Engineering & Biomaterials Laboratory is located within the Fischell Department of Bioengineering at the University of Maryland. Our lab uses the principles of both engineering and life sciences to develop biomaterials that improve the quality of life of ill or injured patients. We begin with polymer science methods to synthesize novel hydrolytically degradable polymers and then fabricate these polymers into easily implantable biomaterials. Molecular and cellular biology principles are then incorporated to understand the interaction of cells, tissues, and higher life systems with these novel biomaterials. Areas of focus in our lab include the study of biomaterials for the delivery of therapeutics, scaffolds for orthopedic tissue engineering applications, and the interaction of biomaterials and tissues. Please use this site as both a window into the work and personnel at the Tissue Engineering & Biomaterials Laboratory as well as a gateway to bioengineering, cell biology, and biomaterials research. A new study written by a team from the Center for Engineering Complex Tissues (CECT) will soon be published in the journal Biomaterials. The study looks into the process of developing a 3D-printed aggrecan functionalized scaffold in order to aid with microfracture procedures. The study’s aggrecan functionalized scaffold showed better improvement of regenerated cartilage tissue than those treated with traditional methods or left untreated. The study was a collaboration between Dr. Jonathan D. Packer from the Department of Orthopaedics at the University of Maryland School of Medicine in Baltimore and departments within the University of Maryland in College Park, MD. Other researchers included Ting Guo, Maeesha Noshin, Hannah Baker, Evin Taskoy, Sean J. Meredith, Qinggong Tang, Julia P. Ringel, Max Lerman, Yu Chen, and John P. Fisher. While millions of Americans are impacted by cartilage defects, the current treatment (Microfracture and Autologous Chondrocyte Implantation) has many post-surgical difficulties and a long recovery time. 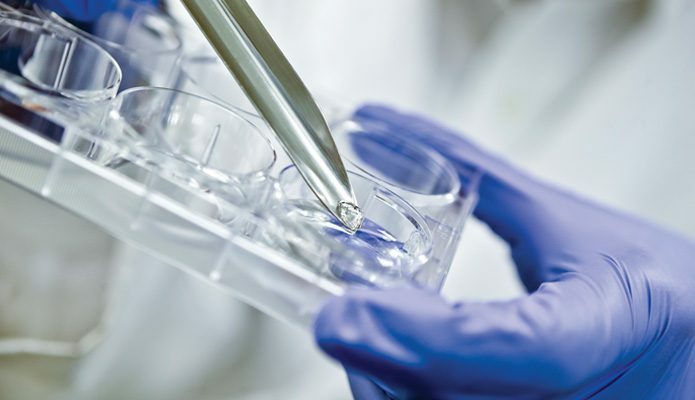 This method involves drilling the layer of bone just beneath the cartilage defect to release mesenchymal stem cells (MSCs). This often leads to a weaker regenerated tissue than healthy cartilage. The new aggrecan functionalized scaffold method used in the study resulted in histologically healthier and thicker cartilage tissue formation compared to the original method. After further examination, the team found that the aggrecan functionalized scaffold led to higher cell adhesion than control groups. For the first time in the field, the team also evaluated the cartilage regeneration at a functional level through a newly designed locomotion test. Despite this, the aggrecan functionalized scaffolds had a more even distribution of newly formed cartilage that was significantly thicker than the other groups. It also showed better chondrocytes growth and ECM formation. This study showed that using an aggrecan functionalized scaffold can lead to better support for people undergoing treatment for articular cartilage defects, as demonstrated by improved tissue quality. 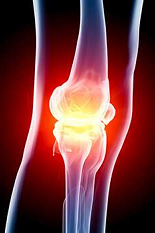 This provides another possible and more efficient treatment method to study and utilize for the millions of patients affected by articular cartilage issues. For more information, the original article can be read on Science Direct. The study has also been highlighted by Science Translational Medicine, which can be accessed here. On Friday, October 12, 2018, TEBL member Charlotte Piard gave a presentation at the 3rd annual 3D Printing and Bioprinting in Healthcare Conference in Brussels, Belgium. 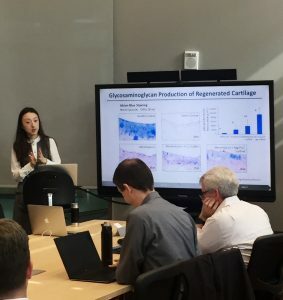 The presentation was entitled “Biomimetic Cell-Laden 3D Printed Scaffolds for Bone Tissue Engineering.” During the presentation, Charlotte presented her research as well as an overview of other TEBL lab research topics. The conference gathers 3D printing industry leaders, business heads, medical consultants, researchers and engineers from across the globe. More information about the event can be found here. The presentation was about keratin and the creation of a resin designed for 3D printing keratin. This resin was then used to determine how much energy projected during curing defines different properties of keratin hydrogels. Navarro and other TEBL members Jay Swayambunathan, Marco Santoro, and John P. Fisher found that energy density regulated the chemical reaction needed to crosslink keratin and determines how much the hydrogels crosslink. This, when taken together with its saturation nature, determine microstructural properties of the hydrogel. 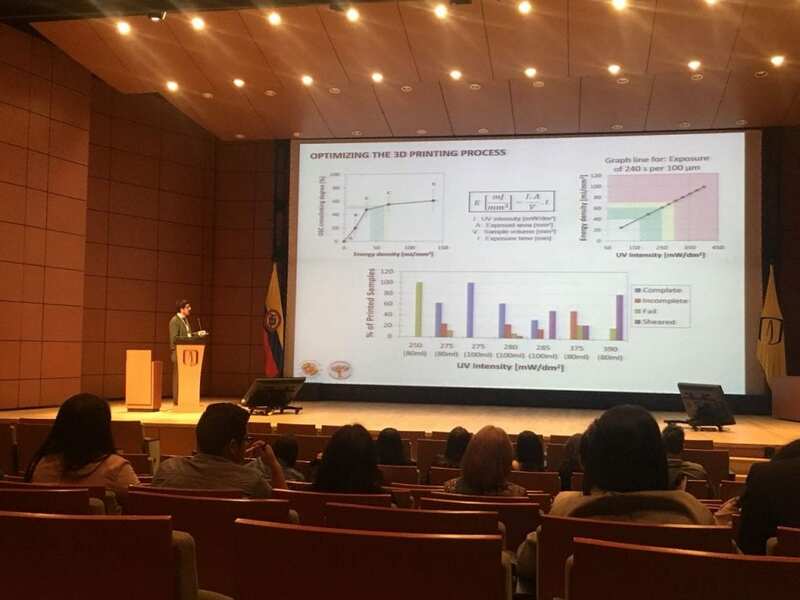 By understanding the role of energy density in creating the crosslinked network, they were able to adjust the printing parameters of the resin in a cDLP 3D printing system. For more information, the IEEE proceedings article can be found here. TEBL lab member Navein Arumugasaamy was awarded 3rd Place for the SYIS Oral Presentation Award at the TERMIS World Congress. The award was for his presentation given during the conference, which took place September 4 – 7, 2018 in Kyoto, Japan. The presentation was entitled “A Placenta-Fetus Model to Evaluate Maternal-Fetal Transmission and Fetal Neural Toxicitiy of Zika Virus.” The topic of the talk relates to recent TEBL publication “Biomimetic Placenta-Fetus Model Demonstrating Maternal-Fetal Transmission and Fetal Neural Toxicity of Zika Virus.” When asked about the award, Arumugasaamy shared, “It’s wonderful to be recognized for our project assessing Zika Virus effects with a placental barrier tissue model, and I’m humbled by the award. It was a great team effort across multiple labs and institutions, and I’m very appreciative of the opportunity to present our work and have it so well received.” Congratulations, Navein! TEBL Article One of Journal’s Top 20 Most Downloaded Recent Papers. Journal of Biomedical Materials Research has recently announced that “Collagen Hydrogel Scaffold Promotes Mesenchymal Stem Cell and Endothelial Cell Coculture for Bone Tissue Engineering” was one of the journal’s top 20 most downloaded recent papers. The journal examined the number of downloads within the first 12 months of online publication for papers published between July 2016 and June 2018. The article was written by TEBL members Bao-Ngoc B. Nguyen, Rebecca Moriarty, Tim Kamalitdinov, Julie M. Etheridge, and John P. Fisher and looks at the role of collagen hydrogel scaffolds and microenvironments in bone tissue engineering. This article helped advance the field of tissue engineering as well as brought visibility to both the journal and our lab. Congratulations, Bao, Becca, Tim, Julie, and John! 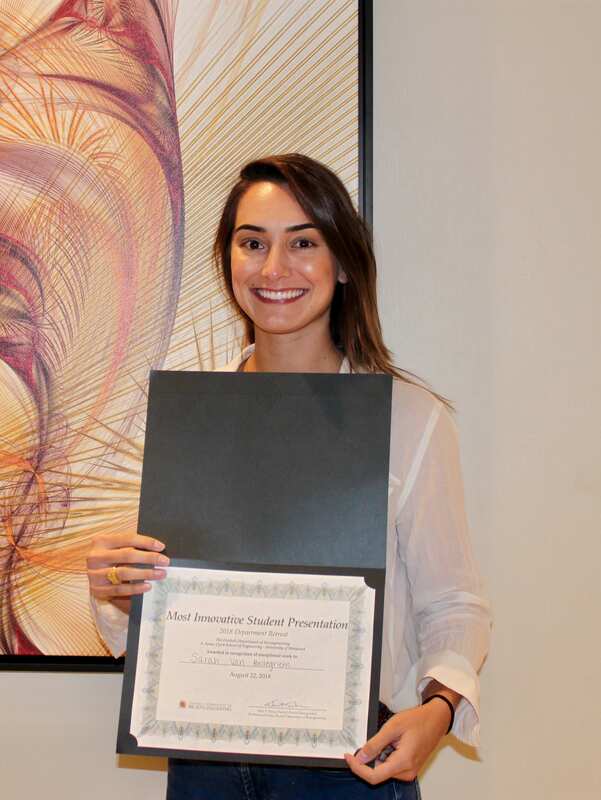 Sarah Van Belleghem was awarded Most Innovative Graduate Student Presentation at the Fischell Department of Bioengineering’s annual retreat, which took place on Wednesday, August 22. 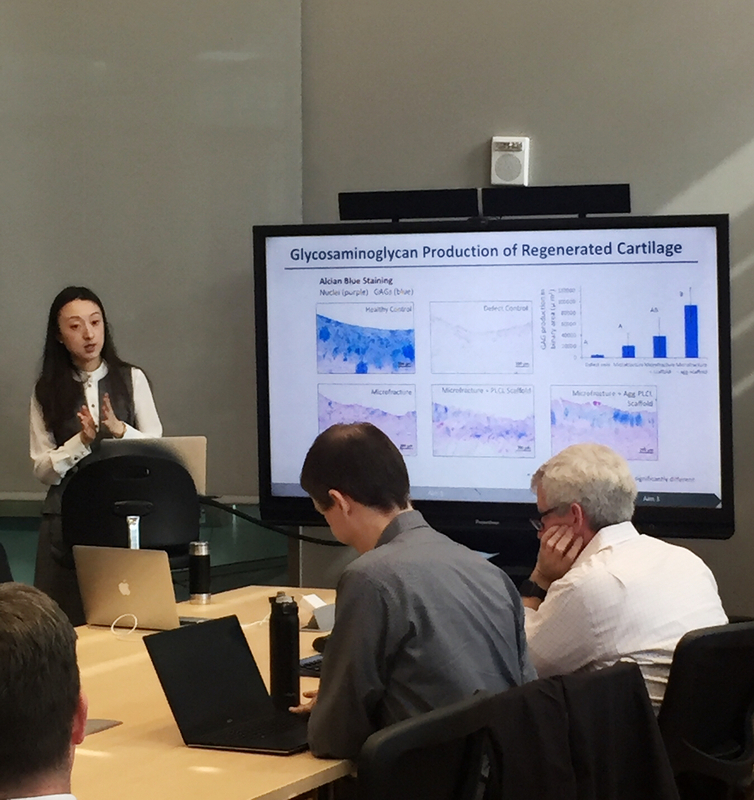 Ting Guo has successfully defended her thesis entitled “Engineering Cellular Microenvironment for Cartilage Regeneration”. Congratulations, Ting! The Center for Engineering Complex Tissues (CECT) has officially launched its new website! The CECT is a NIBIB/NIH Biomedical Technology Research Center (BTRC) aiming to grow the 3D printing and bioprinting community. 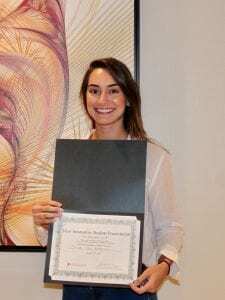 It is a joint effort between TEBL at the University of Maryland with the Biomaterials Lab at Rice University and Wake Forest Institute for Regenerative Medicine (WFIRM) at Wake Forest University. The Center is headed by TEBL PI Dr. John Fisher and features projects building on our previous work developing a tubular perfusion system (TPS) bioreactor that enables human mesenchymal stem cell expansion, their osteoblastic differentiation, and subsequent formation of boney tissue. More information about the Center and its new website can be found here.